It's back to school season and we bet your kiddo is begging for a new eco-friendly backpack! We've picked our out top six kid backpacks for the school year (and hopefully the next and the next). From animal backpacks for the little kids and graphic design backpacks for the big kids, we're sure we've covered every student in your family! We definitely could not do a backpack post without including these adorable Skip Hop Zoo Packs — we love them here at Inhabitots! 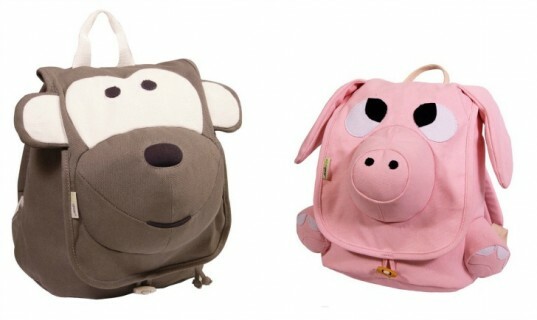 These backpacks come in 14 different animal designs. Each Zoo Pack is equipped with one roomy compartment big enough for books, an insulated pouch for afternoon snacks and an adjustable mesh pocket for their reusable water bottle. Zoo Packs are also BPA- and phthalate-free and have a write-in name tag inside for keeping track of which bag is whose! We also love Skip Hop’s coordinating Zoo Lunchies reusable lunch packs. 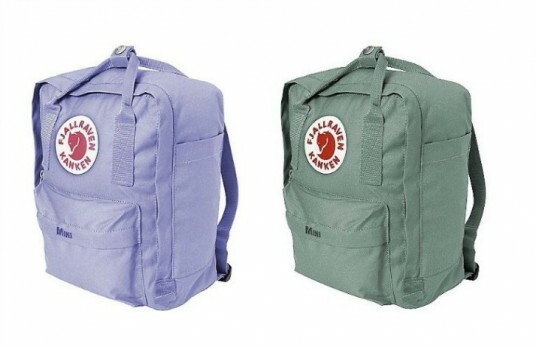 Fjällräven‘s Kånken Mini is the kid version of their sturdy classic pack that debuted back in 1978. This pack was made under human conditions with environmentally friendly fabrics. Fjällräven, which means arctic fox in Swedish, also supports SEFALO in their efforts to preserve the arctic fox and its habitats. Ecogear’s Ecozoo series comes in six cuddly animal designs. They’re made from natural cotton, non-toxic dyes and recycled plastic. These packs were originally $36, but are not on sale for only $27! If your kiddo is past the animals backpacks, Crocodile Creek is the perfect match with their bold colors and minimal graphics. 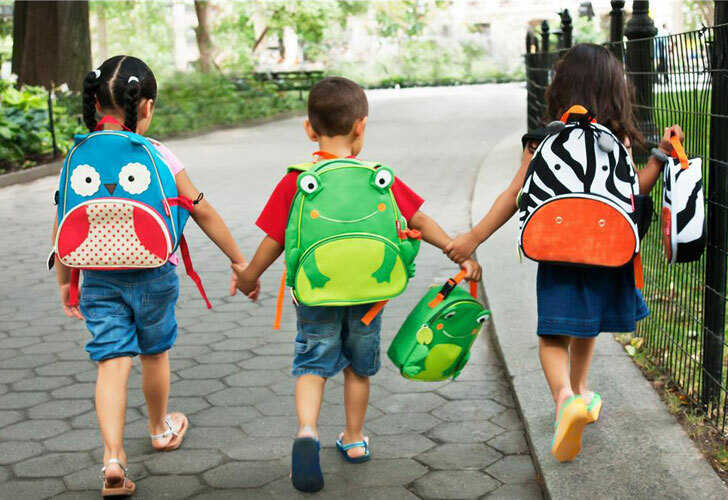 Crocodile Creek’s backpacks come in 10 awesome designs and are PVC-, phthalate, and lead-free. Don’t forget the matching lunch accessories! In need of extra room? Zippee backpacks from O.R.E are big enough to store sweatshirts! Designed with padded shoulder straps and weighing in at only 7 ounces, these packs won’t be a burden for your child to carry. These packs meet or exceed all US, Canadian and European safety standards. 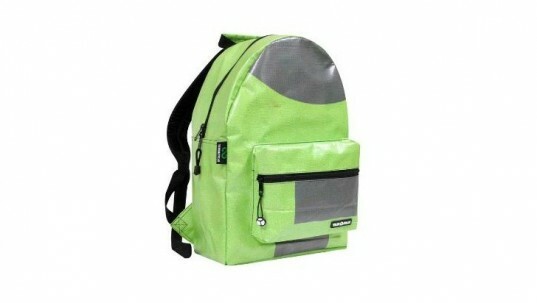 TerraCycle has some awesome upcycled designs, but this backpack is probably the coolest looking. It’s made from recycled vinyl billboards making it water resistant and made to last more than just one academic school year. This backpack is also perfect for laptops as it includes a protective padded layer inside to fit laptops up to 15.6″ wide. 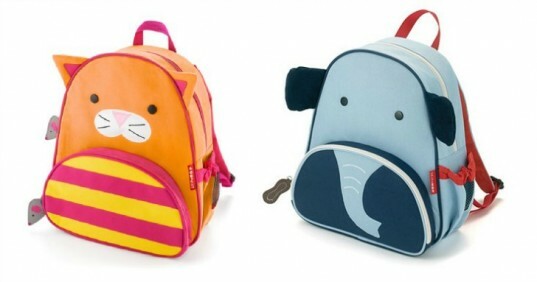 We definitely could not do a backpack post without including these adorable Skip Hop Zoo Packs -- we love them here at Inhabitots! These backpacks come in 14 different animal designs. Each Zoo Pack is equipped with one roomy compartment big enough for books, an insulated pouch for afternoon snacks and an adjustable mesh pocket for their reusable water bottle. Zoo Packs are also BPA- and Phthalate-free and have a write-in name tag inside for keeping track of which bag is whose! We also love Skip Hop's coordinating Zoo Lunchies reusable lunch packs. Fjällräven's Kånken Mini is the kid version of their sturdy classic pack that debuted back in 1978. This pack was made under human conditions with environmentally friendly fabrics. Fjällräven, which means arctic fox in Swedish, also supports SEFALO in their efforts to preserve the arctic fox and its habitats. Ecogear's Ecozoo series comes in six cuddly animal designs. They're made from natural cotton, non-toxic dyes and recycled plastic. These packs were originally $36, but are not on sale for only $27! If your kiddo is past the animals backpacks, Crocodile Creek is the perfect match with their bold colors and minimal graphics. 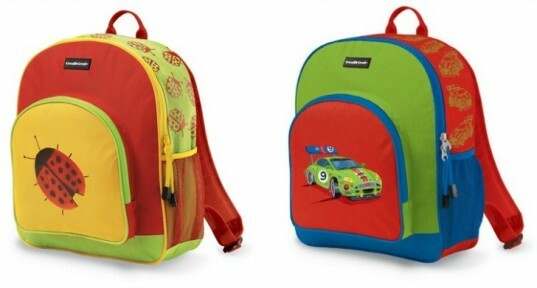 Crocodile Creek's backpacks come in 10 awesome designs and are PVC-, Phthalate, and lead-free. Don't forget the matching lunch accessories! In need of extra room? Zippee backpacks from O.R.E are big enough to store sweatshirts! Designed with padded shoulder straps and weighing in at only 7 ounces, these packs won't be a burden for your child to carry. These packs meet or exceed all US, Canadian and European safety standards. TerraCycle has some awesome upcycled designs, but this backpack is probably the coolest looking. It's made from recycled vinyl billboards making it water resistant and made to last more than just one academic school year. This backpack is also perfect for laptops as it includes a protective padded layer inside to fit laptops up to 15.6" wide.